South Carolina is facing an invasive plant species that could be far worse than other rampant exotics like kudzu. The exotic invasive cogongrass is considered to be one of the top ten worst weeds in the world. 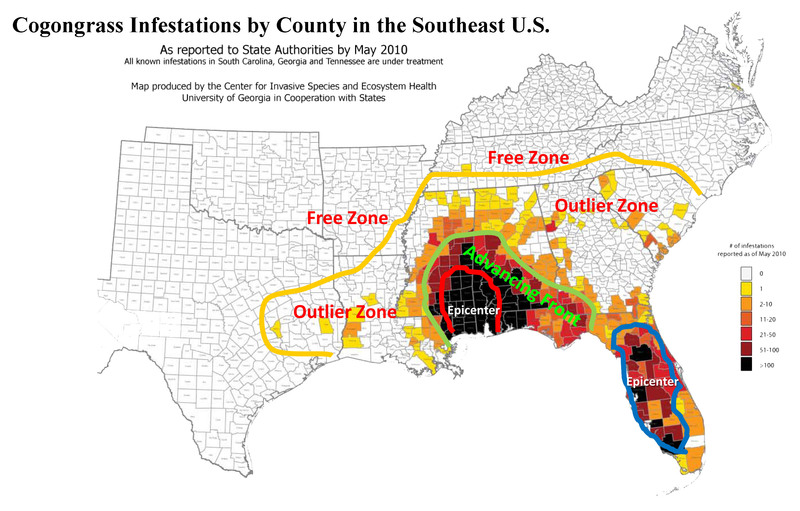 The pest was first found in South Carolina in 1987 at a site in Hampton County that is still active. Clemson University's Department of Plant Industry is charged with the eradication of this plant and has treated all reported infestations, but new sites are found each year. Left unchecked, this aggressive weed forms dense stands over large areas and can virtually eliminate native plants. Cogongrass is mostly unpalatable to livestock and wildlife and can create a significant fire hazard. The invasion of cogongrass into South Carolina is still in the early stages. In order to stop this weed from becoming the complete menace seen in Alabama and Florida, we need your help. Anyone who spends time outdoors can help find this grass and report any sightings. The Cogongrass Task Force has been conducting the volunteer survey every year since 2008. Please consider signing up and helping in the effort to eradicate cogongrass from our state. Become aware of unusual plants in the fields and landscapes you frequent. This website provides reference materials and pictures that will aid with the identification of cogongrass. Additional information, materials and assistance can be found at the local Clemson Extension Office and the local SC Forestry Commission Office. Please notify these offices or the Department of Plant Industry (864-646-2140) if you find suspect cogongrass in your area.